D.W. Gregory’s cautionary tale of Roaring Twenties greed and exploitation opened Feb. 5 to a nearly full house at Reno Little Theater. Based on a true story, Katy Perrell plays Grace Fryer, a 15-year old factory worker who paints little fluorescent dots on watch dials. Along with co-workers Irene (Libby Bakke) and Kathryn (Anna Pidylpchak), the young women shape the tips of their radium-soaked brushes with their lips to paint precise dots. And the health risk? Why none at all, according to quixotic company president, Arthur Roeder (Jeff Chamberlin). But when the women become ill and their best worker—Amalia, who “paints more dials than any one girl” – dies, the others aren’t so sure. Besides, they’re developing phossy jaw: toothaches, oozing abscesses, and their jaws glow in the dark. Meanwhile, President Roeder is concealing damning medical reports implicating Radium, while Attorney Markley (Bob Gabrielli) is offering a load of cash for the worker’s silence. Directed by McKenzie Swinehart, the 2 1/4-hour play has all the elements for an edge-of-the-seat tragicomedy. However, it is anything but that. While the play has light-hearted elements in the early scenes, these actors should have ripped the audience’s collective hearts out as they died slowly on stage. Yet there wasn’t an actor with a credible sniffle, let alone a terminal disease. Even the antique wheel chair prop failed to convince. The characters of Roeder and Markey should have earned audience scorn as symbols of corporate corruption. Certainly, Roeder is more of a compromised and conflicted villain with crumbling convictions than the unrepentant evil of “Wall Street’s” Gordon Gekko. Nevertheless, the wooden performances come across as detached and indifferent rather than unprincipled. The bright spot in the show was the fine acting of Mark Maher, who superbly portrayed Grace’s husband Tom, as well as a reporter delivering rat-a-tat ticker tape headlines, but also the character of Knef and then of course there’s Berry…and that’s one of the complexities in this otherwise straight-forward play. “Radium Girls” was written for 9 to 10 actors who play well over 30 parts. Audiences need to be invested in a character to agonize over their plight or shudder at their wickedness. But once they are, voilà, the actor transforms into someone else in this production. The playwright’s technique left me disconnected. 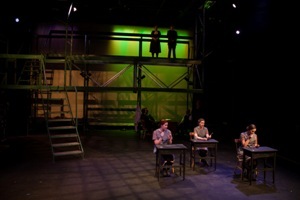 The set was an open, imposing multi-level scaffolding that represented the factory and this bit of symbolism worked well. While workers labored below, management surveyed their every move from above, like prison guards in a watchtower. But while minimalist sets often work to great effect, the most important prop—indeed one of the main characters–was missing from the production: representations of lethal watch dials themselves. I sincerely wish I could recommend “Radium Girls.” What should have been a clarion call that sent the audience into the street to protest exploitation and greed, à la Flint, Mich., left me wanting. Two Radium-soaked stars out of five. Where: Reno Little Theater, 147 E. Pueblo St.